Orthodox Jewish nurses in New York are banding together to combat the anti-vaccination misinformation being spread by a 40-page ‘handbook’ being passed around parents in a religious neighborhood in Brooklyn. The nurses call The Vaccine Safety Handbook: A Handbook for Parents a piece of propaganda and blame it, in part, for fueling the outbreak of measles in their community, which has sickened over 180 people in New York City. Published by a group known as Parents Educating and Advocating for Children’s Health, the booklet is locally known as the PEACH magazine. Its contents look convincingly science-based, but are strewn with citations to known a pseudoscientist, who also claims that his daughter is in communication with aliens. But in insular communities like Brooklyn’s Orthodox Jewish neighborhood of Williamsburg, religious parents are trusted sources to one another, and have been passing around PEACH magazine. The Orthodox Jewish Nurses Association are now producing their own magazine – nicknamed PIE – to try to bat back the spread of misinformation in their community. Not so long ago, measles was considered eradicated in the US, but that has changed in recent years. Amid a surge of conservatism and distrust in authority, the US is now in the grips of the largest measles outbreak in 30 years. The national outbreak is made up of a number of hot spots scattered across the US, and typically centered around tight-knit religious and ethnic communities. Many of these groups are wary of medicine due to their beliefs or cultural morays. Currently, the largest outbreak in the nation belongs to the New York and New Jersey area – and cases are most concentrated around Williamsburg, in Brooklyn. Orthodox Jews operate by their own set of laws based on the Torah. Some of these laws come into conflict with those of other forms of government, creating a sense of distrust of other forms of authorities. Some rabbis have told their communities that vaccines are a money-making scheme for doctors trying to dupe them. Two Jewish laws come into conflict when it comes to vaccination. Among the most fundamental edicts of the Torah says that people must protect themselves from danger – including disease – because life is sacred. It not only directs them to try to save themselves if disaster or disease arises, but to take precautions for themselves and their children. Many rabbis have ruled that the risk of dying from disease far outweighs the ‘risks’ of vaccinations. But others think that because many diseases that vaccines protect against are now extremely rare, the danger calculus has changed. 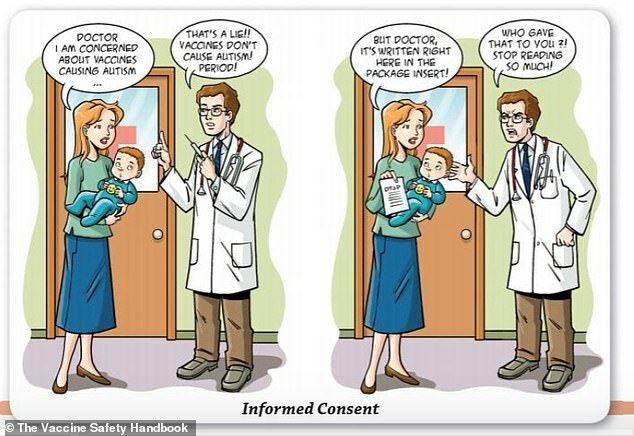 However, this ignores the idea of herd immunity. If less than 90 percent of a population is unvaccinated, the risk of disease becomes considerable once more – as we’ve seen in current outbreaks. 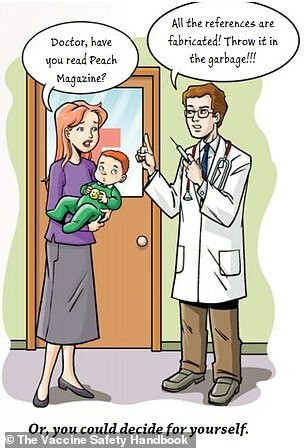 There is some debate among Orthodox Jews about whether or not the Torah permits vaccination as a medical intervention. And the notoriously insular group is hesitant, at best, to look outside its own community for information. Instead, the parents there have been consulting with one another for how best to care for their children. Many pass along the PEACH magazine. PEACH’s handbook blames the impression that vaccines are necessary on ‘media induced fear-mongering,’ despite fact that the near disappearance of measles, mumps and rubella immediately followed the development of the MMR vaccine. 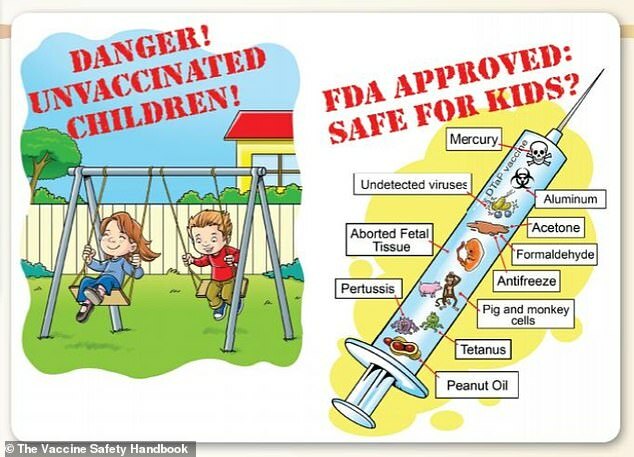 One graphic in the booklet depicts a syringe of the DTaP vaccine, labeling parts of it with fetal tissue, various kinds of virus and toxins like antifreeze, formaldehyde and acetone. PEACH’s magazine also specifically targets Orthodox Jews, discussing Jewish leaders ‘rulings’ that parents have the right to choose whether or not their children get vaccinated, made by rabbis in towns with ongoing outbreaks. But most scholars consider the Jewish law commanding Jews to preserve life, above all or most other laws of the religion. Orthodox Jews and other insular communities, however, are quite accustomed living outside of the norms of social behavior of the surrounding communities, and may be less averse to holding on to unpopular or uncommon beliefs. The Orthodox Jewish Nurses Association hopes to use the tendency for information to be disseminated through word of mouth and relationships – rather than through authorities – to their advantage to change thinking about shots. After discovering the PEACH booklet, a subcommittee of the nurses has come together to make their own guidance on vaccination, Blima Marcus told WNYC and the Gothamist. In a similar style to the PEACH pamphlet, theirs will present research on the safety and importance of immunization, responding to the assertions in PEACH’s publication. The group is calling their pamphlet ‘Parents Informed and Educated,’ or PIE, a ‘tongue and cheek’ response to PEACH, Marcus told the Gothamist. She and her team have compiled the research, but have not yet finished the booklet, which will feature a picture of a rotting peach on its cover. The booklet is due to be printed in the coming weeks.